Another informative joint Institute of Navigation (ION) International Technical Meeting and Precise Time/Time Interval Meeting is in the books and attendees of the event this week in Monterey, California had the opportunity to learn and share ideas on a wide array of topics and technologies. On January 31 at the ITM/PTTI Plenary Session, Carlene E. Stephens gave an entertaining presentation titled “Back to the Future: Forecasts for Time and Navigation, 1917 and 2017.” Stephens, the curator, division work and industry at the Smithsonian National Museum of American History, explored significant forecasts made a century ago about time and navigation and related them to the future. She included examples of accurate predictions made 100 years ago about advancements in automobiles, as well as some that were way off in regards to aviation and submarines. The insightful presentation also looked at the future, referring to some ideas explored at the ION GNSS+ 2016 meeting last September that included self-driving cars, NASA’s recruitment of explorers, the fate of the leap second and more. After Stephens’ talk, three days of technical meetings followed with experts and researchers delivering papers on several projects dealing with GNSS advancements, the mitigation of jamming and spoofing, atmospheric effects on GNSS signals and much more. On the PTTI side, several presentations addressed time scales and algorithms, optical clocks, the role of the PTTI in the financial sector, and advances in GNSS time transfer. The four-day event, which was held at the Hyatt Regency Monterey from January 30 to February 2, included exhibitors from several companies involved in receiver, simulator, timing and other GNSS technologies. 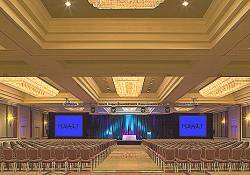 ION has its ION Pacific PNT Conference 2017 coming up May 1-4 at the Marriott Waikiki Beach in Honolulu, Hawaii. ION’s Pacific PNT Conference is a global cooperative development of Positioning, Navigation and Timing technology where policy and technical leaders from Japan, Singapore, China, South Korea, Australia, the United States and more meet to discuss policy updates, receive program status updates and exchange technical information. The conference will include tutorials and a table-top exhibition. Additionally, the annual Joint Navigation Conference is a military positioning, navigation and timing (PNT) event hosted by ION on behalf of the U.S. Department of Homeland Security. It will be held at the Dayton Convention Center in Dayton, Ohio and the Air Force Institute of Technology at Wright-Patterson Air Force Base nearby. It will emphasize joint development, test and support of affordable PNT systems, logistics and integration. Sessions will focus on battlefield applications of GPS, field navigation devices, PNT requirements for troops in the field, and navigation warfare. Attendance is limited to United States government agencies and military contractors. The exhibit hall (June 6-7) will be restricted to U.S. citizens only. For more information on attendance requirements and procedures, go here, and for more details on the conference you can visit the Inside GNSS Events section of the website.